Framing a sense of direction. Without any doubt, the biggest misconception on any innovation is that someone knew it all before. That, for example, Steve Jobs had precisely on his mind how an iPad would function with app’s. Or that Tim Berners-Lee knew what the world wide web would look like when he implemented the first successful server-client communication. Put differently: that an individual genius ‘knows all’ and simply needs experts to put his dream into reality. The reality of innovation is rather different. It is about serendipity, complexity, luck, hard work, learning by doing, and failing often. But most of all: it is about teams. Teams of extraordinary individuals who together contributed the knowledge and skills that led to a game changer. An example: many of us would die from ordinary bacteria even today, if Fleming’s discovery of the antibacterial effects of penicillin was not picked up by a research team in Oxford. Headed by Howard Flory, the team was capable to turn the paper of Fleming into a medicine that saved millions of lives. Flory was responsible for the clinical trials. Ernst Chain discovered the chemical composition and theorized the structure. Junior researcher Norman Heatley (who did not share the Nobel price) invented a method to manufacture penicillin in bulk, so that it became available. Many more contributed, to produce it in mass quantities. It is the combination of their skills that made the breakthrough. Or, precisely as Flory put it: ´Developing penicillin was a team effort, as these things tend to be’. But that poses an interesting paradox that is hardly discussed in literature. How do these teams, or rather the individual members, know what they will create together? They can’t know that exactly. Yet each of them has to make a hundreds of decisions every day to advance his work. Decisions on the base of a future he envisions. A future that is unknown, because it is shaped by the collective decisions made in the team. How do they do that intelligently? And how do they coordinate their collective efforts and decisions into one, seamlessly integrated product, service or system on the go? To solve this -implicit- paradox, most textbooks that students read on product development and innovation will resort to well managed processes, good managers and visionary, inspirational leaders. No doubt about it, these are needed badly to get any innovative idea across ‘the valley of death’, but do not solve explicitly the paradox. The same books also discuss list of requirements, project descriptions, plans and specifications. But if one can provide a project description and a plan, the innovation has come into reality already. Otherwise nobody can describe the innovation! Tools as planning are excellent for the stage of engineering, once the innovation is well understood. Activities can be planned, specialists can be recruited, finances can be sought for. To reuse the example of penicillin: once it was shown that people with infections were cured, it was fairly easy to interest pharmaceutical companies in the US to device and plan the mass production. For these organizations, the innovation felt new and risky, but in reality, most of the intellectual work was already done and the main risks addressed long ago. Once an innovation can be planned and managed in a classical sense, 80% of the work has been done already. So: what guides teams before the stage that activities can be planned? The specialists need a sense of direction, even though the goals isn’t clear yet. In my research and work, I discovered the need for ‘frames’ that work at team level. A frame is a notion put forward most of all by Donald Schön in his book on individual professionals. Frames in Schön’s book are a ‘kind of discipline’, to provide coherence to a particular problem. A frame categorizes what someone sees, interprets and knows. Frames are subjective and provide a context for (future) activities, e.g., by doing experiments. Frames can be found easily in teams, and a powerful frame provides the sense of direction needed to guide teams in period before activities can be planned exactly. An excellent example of such a frame is provided by the famous speech of JF Kennedy at the Rice University: “.. the goal, before this decade is out, of landing a man on the moon and returning him safely to the earth.” An ambitious goal and a rough planning that provided the sense of direction to guide thousands of NASA engineers for years, without spelling out what was needed exactly. Now: what makes a frame a productive frame, that is: guiding all future activities? First of all a frame must be sufficiently robust to maintain a common identity for all involved, yet plastic enough for each specialist to explore and experiment. A ‘man on the moon and back’ includes a clear goal and includes many (new) problems, impinging the creativity of many experts. How to launch a relatively heavy moon lander from earth? How to land on the moon safely? What suits could astronauts wear? How can they sleep? What can they eat? How will they urinate? Many experts can align and coordinate their activities well, even without a perfect first plan. And relatively apart from each other. It has the charm of the skeleton of a building: you get a sense of what the building will be, but provides ample space to imagine and dream what it might become. A good frame has a vigor and a charm, so that people commit themselves, and leaves open sufficient space for individuals to explore solutions. Second, a frame should be persuasive, so that people can commit themselves. 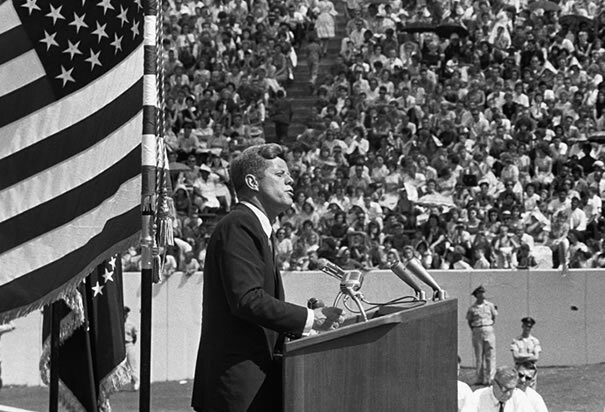 It is hard to imagine that the Apollo project would never have started without the persuasive framing JFK put forward. But consider that Fleming’s discovery of penicillin almost went unnoticed, because the was a famously poor communicator. His findings received scant attention from peers, if not contempt. He was unable to commit a chemist to help him extract and stabilize the antibacterial compound. Chain and Floret started their work independently from Fleming nine years later. It is like a scientist discovering something to cure ebola and other nasty viruses, only to discover that nobody is interested because he lacks the skills to ‘sell’ the idea.